It was a daunting task deciding where to send our son to kindergarten, as we both grew up outside of Vancouver. It was during our school visit with the principal, Ms. Foran, that we knew ICS would be a good fit for our son and family. During our tour we were warmly welcomed by all the ICS staff. Ms. Foran knew all the students’ names and would randomly ask them why they liked ICS. There was an abundance of heartfelt answers as to why ICS was an excellent school. We were also impressed with the older boys interaction with our son, who was 5 at the time. They asked our son if he wanted to play ball with them - they were inclusive and excellent role models. “Teachers who love teaching, teach children to love learning.” Our son is eager to go to school and is excited to tell us about his day. Whether he is telling us about the alevins that will turn into salmon; the author Holman Wang who visited their class; or what kindness means, he is proud of his day. We are not only happy with our son’s new love for learning, but his progress with reading and writing this year. We truly cannot say enough about the quality of teachers and staff. It is our second year at ICS and holidays are now hallmarked with various ICS traditions. Our family’s favourite event is the ICS Christmas Fair which starts our Christmas season with fun games and time with other families. The sense of caring and inclusion from the ICS community has made our family grateful to have found this blue gem of a school. Education with great discovery, high achievement, and deep passion! 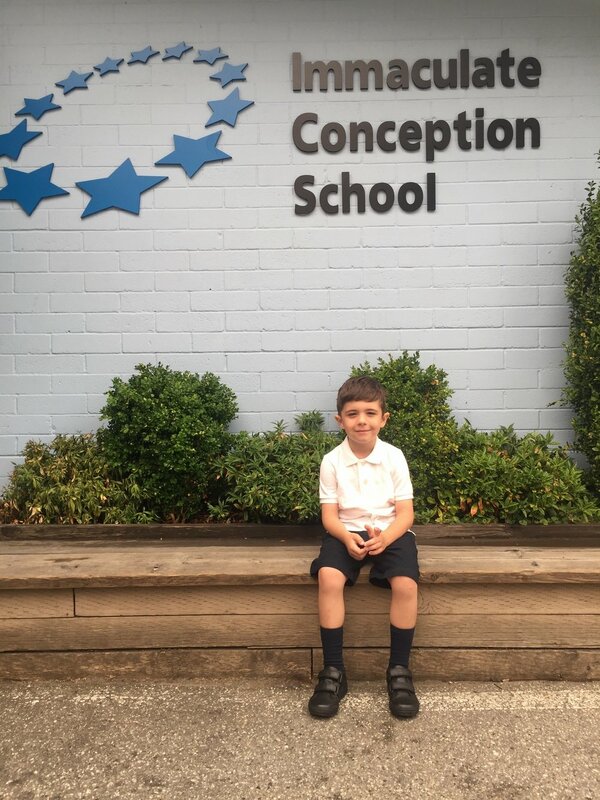 Our son started attending Immaculate Conception School six months ago and we couldn’t be happier with our choice. My husband and I searched and searched for a great school that would pay attention to individual needs and engage with all students, and then we found ICS. A child’s mind is hungry for knowledge and has the capacity to take in so much if one is willing to engage them further than just a day-to-day routine of simple play centers, occasional songs or reading time that lack deliberate purpose - we found this quality of engagement on our visit to ICS last winter, and have witnessed it every day since. Previously I’d heard about this great school from a friend at UBC. We’d also come across ICS in our own research and while reaching out to other parents who might have information or experience with the school, I realized this was the school mentioned to me previously, and everything else fell into place from there. All things mentioned about the school were great, but even when scheduling our visit, I was with guarded skepticism that the school had to be too good to be true. When my husband and I entered the school grounds we knew this was the school for our son! ICS is nurturing and engaging, fun and challenging in its educational approach to its students. The nurturing does not stop short with the students, but extends to the parents as well. ICS has given our son the academic skills and organizational tools to achieve great success in his daily school life. He loves his ‘little blue school' and we always have a difficult time leaving the campus after school as he wants to linger and play with his friends. There are many qualities beyond ICS’ educational curriculum that we love about the school. Some that come to mind right off the bat, and that are equal in importance to education, include our feeling of a secure sense of our child’s safety behind the ICS doors. There is a real sense of community among the teachers, students and parents and the warm, friendly and welcoming environment has made the transition to ICS very easy for both our child and us, as parents. The principal knows everyone, and everyone is greeted and welcomed at all times. It’s the magical community here at ICS that we just love. ICS encourages and embraces parental involvement with the children as well as the school. I can only speak from our perspective, but there is just something reassuring about our child’s love and comfort found in his connection with his teachers, and bearing witness to this is just that much sweeter. Our experience is that ICS is staffed with wonderful teachers and aids. The principal and the support staff are attentive to parental inquiries and address any concerns a parent may have. ICS represents the evolving nature of education. Teachers put students in the centre of their plans, set them up for maximum success and optimal academic performance. We are confident our son will go on to become a great leader and innovator. At ICS, you will experience an education with great discovery, high achievement and deep passion. We are pleased to see that the students embody so much diversity and inclusion. Everything and everyone is connected at our little blue school. You can draw a line from one point to another and, along the way, you’ll find so many different ways the points are connected. At ICS, it’s fun seeing how connected you are to people through mutual friends and common interests. It’s about focusing on what we share, not how we differ. Most of all we appreciate that the educators are united in teaching from a moral compass, which includes a routine of praying and respect for God. On top of all of that is the diversified education offered at ICS that we love! Our son loves connecting with a ‘buddy’ from older grades once a week. This program has helped our son to connect and build school-wide relationships and learn to develop positive friendships. These relationships help students with confidence and interpersonal skills. We often talk about French and music class in the car on the way home. Exposure to a variety of subjects has helped our son to develop an appreciation for arts. He loves his French and Music class and often talks about other languages that exist around us. If you are looking for something special for not just your child, but your family as a whole, I would highly recommend giving ICS consideration without hesitation! 2015 was a very difficult year for our family. We experienced serious illness, loss of a loved one, and discovered that our son was being bullied at school. We tried to get support and even though the teacher was great, we did not feel supported by the principal. It was in May, already late for switching schools, we had missed all the open houses and kindergarten registration for our daughter. Having a child being bullied is one of the most stressful events in a parent’s life. I remember praying a lot every night for a solution and one day the idea of switching to a Catholic school came to me. I’m Brazilian and I attended a Catholic school all my life, but being an immigrant to Canada and not being married to a Catholic, I hadn’t considered this possibility before. I remembered going to a Christmas Mass at Immaculate Conception a few years ago and looking over at the little blue school. In my memory, it was a warm and welcoming community at the church. Even though there are two Catholic schools much closer to our neighbourhood, ICS was my first choice. I checked the ICS website and made a phone call, hoping to book an appointment with the principal. The person who answered the phone was so friendly and efficient, she asked right away which grades I was interested in, confirmed that there were spots, and asked me to come by and get the documentation. Best first impression possible! It was all meant to be. We went to visit the school and to meet the principal with our children . We were all so impressed by the way Miss Foran talked to every student who passed by, addressing them by name and mentioning their siblings! It was such a diversity of backgrounds in a happy atmosphere that it reinforced this was the right choice. ICS made arrangements for our son to come over and meet his future classmates during a class. We also attended a meeting for new families and were so surprised by the parents talking about opportunities for volunteering at the school, not as a chore to raise funds, but as a fun way to make new friends. On the first school day in September, Miss Foran greeted our son by name and had already memorized all our names. Being a new student in the Grade Four class, his teacher made sure the transition was an easy one. At first, we were worried about being able to put in all the volunteer hours as we both work full time, but it soon became clear how manageable it is when people are accommodating and willing to have you around not for the extra pair of hands, but for the spirit of community building. We have spent some of our most rewarding moments volunteering for the events at ICS and have passed our mandatory minimum hours with great pleasure. Being in a faith based school has so many advantages! The kids come home talking about how their class has prayed for someone’s relative who is sick or has passed away. We can all celebrate Christmas and Easter fully and faithfully. Father Paul is wonderful with the kids, preaching the sermon at their level of understanding. The school mass, with the kids serving and reading, always makes me emotional. It took a sad event to give us this wonderful gift, but we feel so blessed for being a part of ICS. The best hidden secret of our little blue school is the amazing parents! In 16 years in Canada, I had not met such a wonderful, welcoming, supportive and involved group of people who really work hard to make this school the best environment for all the ICS community. What does ICS mean to our family in 3 words? Best decision ever! 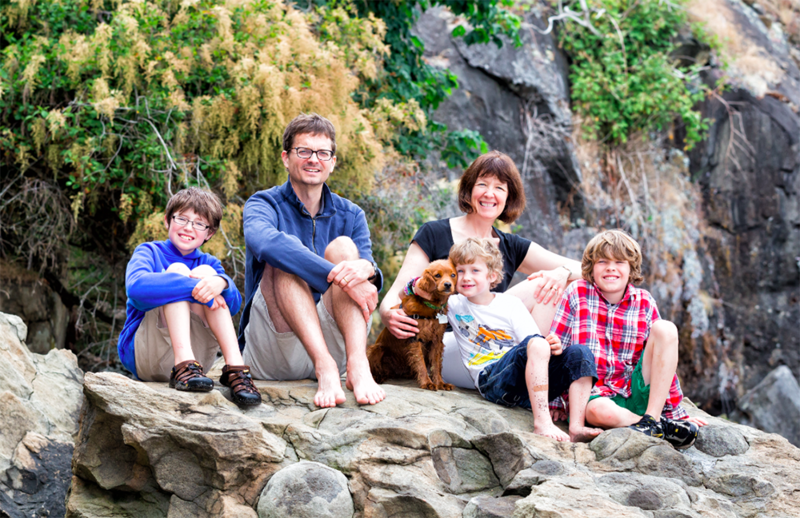 After homeschooling our 3 children for 6 years, we decided it was time for a change. With much thought and prayer, we were led to Immaculate Conception School near the end of the 2013-2014 school year. Through co-workers whose children attended ICS, we had heard a great deal of positive feedback about the unique close-knit community that embodies ICS. Despite this, our reservations about making the major transition from home to school were significant. Homeschooling was a lifestyle that we fully embraced with its freedom for individual creativity, learning styles, and parental involvement that would be hard to replace in a large classroom. It was also very important to us that our children continue to grow in the knowledge and love of Christ, which was woven into almost every subject area of study at home. My wife and I are full-time professionals who work and live in the Vancouver area. We wanted our children to go to an independent/private elementary school. Having attended both independent and public schools during my youth, I developed a preference for independent schools because of the structure, discipline and teaching. Plus the uniforms are nice. All parents want the best for their children. But I admit that what’s ‘best’ is a very subjective matter. Is it better to place pre-adolescent children in a highly academic and competitive environment thinking that a rigorous academic curriculum will help them better prepare for the inevitable rat-race of life? Or is it better for children of elementary school age to revel in the simple joy and innocence of early childhood, progressing comfortably and naturally in mind, body and spirit? 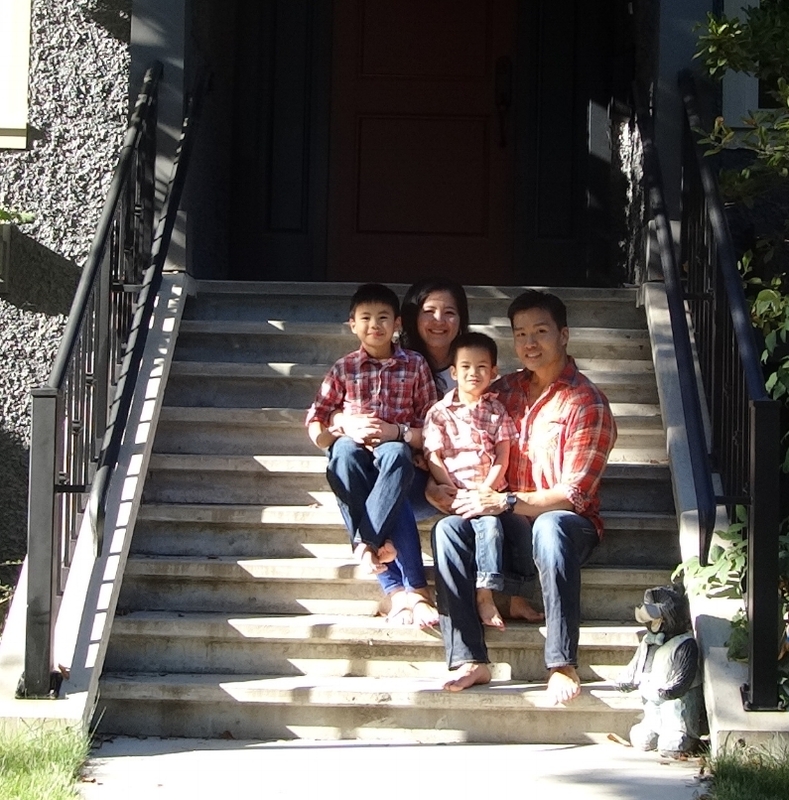 When our oldest boy was coming of Kindergarten age, we contemplated several Vancouver independent and private schools. However, we ultimately decided to eschew the ‘obvious’ choices – the large, West-side schools with the big reputation. Instead, we decided to put him at ICS. You see, I went to ICS when I was a kid. It was the Fall of ‘77 when I entered Grade 1 at ICS, having just immigrated to Canada. I was a very introverted child, full of insecurities and anxieties. But life is a journey, and fortunately, I was able to overcome those fears. Looking back upon those years, I credit ICS for playing an invaluable role in shaping my adolescence and helping me to conquer my feelings of inadequacy. Mutual respect. Responsibility. Accountability. Empathy. Community. Those were the key values that were instilled in me when I was a student at ICS. At ICS, we were encouraged to love and respect one another and to always strive to be better human beings. As a Catholic, I appreciated having those fundamental values instilled in me through the prism of my Christian faith. My favourite teacher was Mr. Jang, who inspired my creative instincts. He was a great role model – a humble, generous and brilliant man. I will always cherish my years at ICS. I am happy to see that ICS today is still what it was back when I was a student. It is still the same little blue school with a big heart and great teachers. The underdog of the West-side that punches above its weight, ICS still manages to promote discipline and academic excellence within the framework of the school’s core values and mantra – “growth in knowledge, love of God and service to others”. And the school is still fun! Halloween, the Christmas Fair and Sports Day, to name a few of the many yearly events. Each December, we look forward to the annual Christimas Paraliturgy where parents, students and teachers all come together to pray, sing and witness the Nativity pageant so adorably re-enacted by the Grade Ones. We also appreciate that ICS has a strong Speech Arts Program, which children can choose to recite prose and poetry as early as Grade One. It encourages the kids to be comfortable with their own voice and to speak confidently in public – a very important life skill. Another reason why we decided on ICS is the school’s principal. We were very impressed with Ms. Colette Foran, who also happens to be an ICS alumnus. She is smart, tireless, dedicated and genuinely concerned about the welfare of every student. I know of no other school principal who would send an individual hand-written postcard to each and every student during her summer vacation. But that is exactly what Ms. Foran did! ICS is a big part of our family life. We are truly thankful and blessed to be a part of the ICS Community. Our three boys have attended ICS for the past eight years, when our first started kindergarten in 2006. When we started looking for a school for our eldest, we wanted something small and community-based. While chatting with a friend one day, I learned that you didn’t have to be Catholic to attend ICS, so we added it to the list of possible schools for our sons. Then at a preschool parent education night, there was a panel of representatives from local schools that included Sue Dvorak from ICS. She was so warm and inviting and said two things that stuck with me, “At ICS, if you try out for the team, you make it” and described ICS as a “faith-based community”. I immediately felt drawn to the school as an inclusive place where our religious values would be fostered in our children. We applied and got a kindergarten spot for the following September. We have never looked back. It has been a wonderful faith-based learning environment for our boys and an anchor to the Dunbar community. It is small enough that you get to know everyone; its own little village. I love that the church and school are connected and that religion and religious values are woven into the curriculum. I love that God and Jesus are everyday words and not taboo in the educational setting. I love that every day starts with prayer. Academically, I think the teachers put extra effort into teaching the curriculum in creative ways that include field trips, art projects, themed-based units and raising social consciousness through outreach. French is taught from kindergarten onwards and our second son is excited about learning the guitar in music class next year. Our boys are anchored in the traditions of the school year: the walkathon, the book fair, the Christmas fair, the Chow and Cha Cha, to name a few. They enjoy the predictability of having events to look forward to year after year. I have two favourite school events. First of all, the Christmas fair. We shine! All the best of us is shared with the community. I love seeing the high school kids that have graduated from ICS who come back to volunteer. It’s fun to welcome neighbours and friends into the school. Most of all, it’s a great way to get to know fellow parents as we come together to make it all happen. My other favourite event is the Mass on the last day of school. The first year I attended, it was with some trepidation. I’d never been to a Catholic Mass. I loved it and felt very welcomed, just as our boys have been welcomed and never made to feel like outsiders. To this day, eight years later, I always take the last morning of school off work to be there, to join in song and prayer as Father Paul blesses the students heading off on summer vacation. Our little blue school has been and will continue to be a wonderful educational haven for our boys in the midst of a big and busy world; a safe place where they can truly grow in knowledge and the love of God. Eddie & Erma Campbell’s children started attending ICS in 1968 – Eddie Jr., Angela, Lorna, Karen, Katherine (the twins) & Melody all attended. There have now been two generations of children attending ICS since 1968. Six from the 1st generation and six from the 2nd generation. Musqueam Indian Band Members had two schools to choose from for elementary school and that was ICS and Southlands, our parents chose ICS. Many years later, my siblings and I have chosen ICS for our own children because we went there and found that all the students and teachers were so close and shared a great connection. ICS has an exceptional curriculum for the children and also provides us with access to the supports that any of our children might need. The continued communication with us as parents to keep us involved in our children’s education is very meaningful to us. And most of all we are accepted with opened arms filled with love and respect. We as Catholics, value our faith being taught to our children and this provides them with a sense of belonging and family at ICS. There are several events throughout the year at ICS that are our favorite, but I have to say that the Christmas Fair is the one that has us excited. It’s such a happy occasion for all the families in ICS to participate in and to be at. The feeling of community really shows here. Having attended ICS as a child and having children attending ICS has provided our family with the opportunity to learn about the Catholic Faith and how it relates to our everyday lives. The curriculum offered has provided a good education and opportunities to be involved in different events such as the choir and different sports teams. Going back to ICS on a daily basis brings back a lot of memories for me, especially since my classmate is now the Principal! When we chose Immaculate Conception School as the elementary school for our children many years ago I did not realize at the time that we were choosing much more than “where our kids would go to school.” Having just completed 18 continuous years of attendance, as all six of our children moved from Kindergarten through to Grade 7, I see with great clarity that what we chose back then was the place where our children would grow up. We are grateful, happy, and blessed that our family grew up at ICS. School life immerses children in a particular environment day after day, from four year olds whose backpacks look half as big as they are right through until they are thirteen year olds taller than their mothers. School life has a great influence on a child’s experience of ‘childhood’. All schools teach academics, organize educational and enriching activities, and offer team sports: ICS does these things well. But what ICS offers that is unique, difficult to measure but easy to feel, is an atmosphere of faith and of family woven into daily life at school. The school is a community where children are taught daily of God’s infinite love for each one of them, taught of the value of every person’s soul, the beauty of their own personal gifts, and their calling to contribute. In this small school students are taught to care for one another and they learn over their years there what it feels like to belong, to be known well, to have influence, to be significant, to have responsibilities towards others. Students feel comfortable to be themselves and so at the same time to take risks and try things. Then they take all this with them. In this competitive world, it’s funny that the very attributes that can be too readily overlooked as “soft skills” are in fact the deal-breakers and difference makers in life. It’s true in people and it’s true for schools. As our children have moved on to high schools and universities of their choice I know they take along with them the solid academic grounding and, arguably more importantly, the faith, confidence and happy memories gained during their simple, beautiful childhood years spent at ICS. It’s been so good and we are grateful.